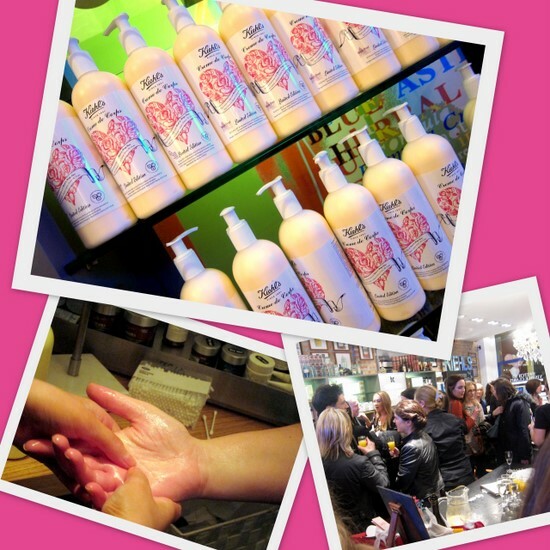 The new limited edition design; attendees at the launch and me, enjoying a complimentary hand massage at the event! Kiehl’s Crème de Corps body cream has a massive cult following who revere its silky texture and the glow it imparts to the skin. And recently it felt like all of them had flocked to the Wicklow Street store in Dublin, to support a new partnership with supercool mother-and-daughter duo, Pearl and Daisy Lowe. The genetically blessed British designer and model have teamed up on a limited edition re-design of the Crème de Corps label; Kiehl’s will donate €2.50 (plus VAT) of the retail price of every bottle sold, to Temple Street University Children’s Hospital. Temple Street do tremendous work with tens of thousands of children every year who are suffering from all manner of illnesses and injury, so this is a lovely cause to support. Crème de Corps by Pearl & Daisy Lowe is available now at Kiehl’s Boutique, 35 Wicklow Street, Dublin 2 and Dundrum Town Centre. It’s priced at €31 for 250ml and €52 for 500ml. I've never tried this, but will go into John Lewis for a test!! I've never heard of this stuff but it sounds nice. I used to wear Kiehl's and am not sure why I stopped--will have to pick some up again soon. This looks like such a fun gathering for a good cause! You'd love their products Laura, they're really lovely! I'm a Kiehls die hard. I live in the stuff, old and new products! Love Kiehl's, such great products!